A previous instance of SCP-XXXX-2 recovered from a personnel break room prior to containment revisions. Special Containment Procedures: SCP-XXXX is to be secured in a designated storage locker in Wing F of Site-██. Under no circumstances should SCP-XXXX be accessed without authorization by site command. Research personnel tasked to SCP-XXXX must fill out a formal requisition form prior to any subsequent testing. SCP-XXXX is only to be opened under laboratory conditions. Description: SCP-XXXX is two items: an envelope containing a gift card and gift-wrapped cardboard box with dimensions 30.5cm x 24.1cm x 15.2cm, designated SCP-XXXX-1 and SCP-XXXX-2 respectively. When held by human hands, the holder's name appears on SCP-XXXX-1 and an unknown object is 'placed' inside SCP-XXXX-2 once the package is opened. Testing has shown that the weight of the box does not change until opened by a human. Handwriting on SCP-XXXX-1 and contained objects within SCP-XXXX-1 and SCP-XXXX-2 varies by whom it is held by. Testing has confirmed that SCP-XXXX's contents are directly proportionate to the actions of the individual, which has ranged from a pair of Siamese kittens to a timed explosive with a ██ megaton yield. After one or both items are compromised a new instance of SCP-XXXX will replace the previous, within approximately two (2) minutes, with a resealed envelope and new wrapping paper. The size of the envelope and the package never change between instances. 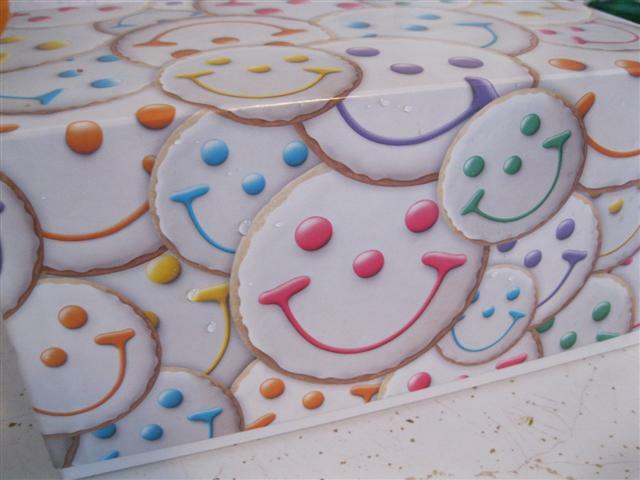 Every instance of the wrapping paper always depicts smiling faces in some form. SCP-XXXX-1 is always taped onto SCP-XXXX-2 whenever a new instance appears. Due to the unpredictable nature of SCP-XXXX's 'gifts' all tests must be taken with utmost care. D-Class personnel assigned to open SCP-XXXX must be screened prior to testing. D-Class personnel with a history of arson or knowledge of creating/handling/disarming explosives are not allowed access to SCP-XXXX. Research personnel who wish to open SCP-XXXX must undergo a psychological and background examination before any attempt to do so. All personnel opening SCP-XXXX must first open SCP-XXXX-1 then SCP-XXXX-2 for any results to occur. All events (including ones not done inside laboratory conditions) of opening SCP-XXXX shall be cataloged for research. See Test Log-XXXX. Proposal to upgrade SCP-XXXX from Safe to Euclid is pending. Classification as a sentient SCP is also pending. Results: First report of opening SCP-XXXX within Foundation possession. Agent T████ opened SCP-XXXX-1 with the card reading: "██████, You've been doing a great job on duty. Here's a little something-something for you. Signed, a friend" Upon opening SCP-XXXX-2, Agent T████ found twelve (12) magazines corresponding with his personal interests. Agent T████ later adds that the magazine's contents were censored in some areas. Much to his disdain. Notes: During initial recovery SCP-XXXX was used as a motivational tool for Foundation personnel. Containment procedures were modified so Level 2 or higher personnel can check-out SCP-XXXX for 24 hours for personal use. Results: First instance of SCP-XXXX to cause a causality. Researcher ████ was given SCP-XXXX on her birthday. The card read "HAPPY BIRTHDAY!" in large colorful text with smaller saying: "Hope you enjoyed your surprise party!" Immediately after opening SCP-XXXX-2 a pie filled with strawberry filling launched from the box colliding with Researcher ████'s face. Researcher ████ immediately went into anaphylactic shock. Medical personnel were unable to treat her in time. Notes: SCP-XXXX was considered a mostly harmless package which, at worse, gave the recipient a cheap scare. Only one instance prior to this event had caused physical harm to Foundation personnel. See Incident Report XXXX-001 for more information. Further investigation of this incident has shown Researcher ████ was recently on a project dealing with SCP-███. Her involvement had caused the death of a D-Class via asphyxiation and cardiac arrest. Much like her own. After this incident, containment procedures were modified a second time, with on and off testing between the more strict check-outs for Foundation personnel. Results: Handwriting on SCP-XXXX-1's card was much less legible than previous iterations. The card's message was handwritten and read: "[D-XXXX-1], You made it this far in life. Congratulations! Have a cookie." Upon opening, SCP-XXXX-2's contents was a large chocolate chip cookie and a 12oz. bottle of milk. D-XXXX-1 was asked to consume the contents of SCP-XXXX. D-XXXX-1 was kept in observation afterwards for four (4) hours. When inquired about SCP-XXXX's contents he stated the cookie was 'the best he has ever had' but complained about the milk being too warm. D-XXXX-1 suffered no ill effects from SCP-XXXX and remained in exceptional health until termination.